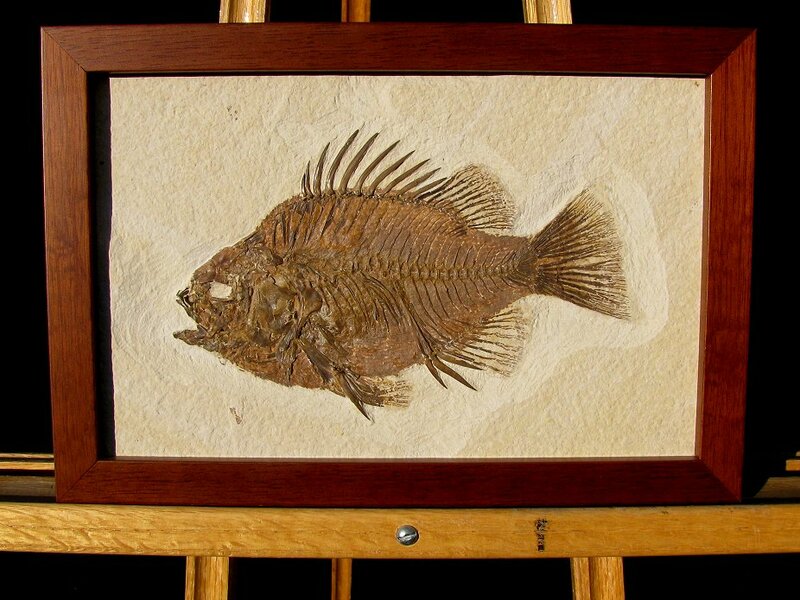 Size: Fish is 7.3 inches, frame is 7.6" X 11.2"
This is simply one of the best fossil fish we have ever seen, period. It is a very large Priscacara serrata from the Green River Formation of Wyoming. This type is very sought-after because of its recognizable look - similar to a modern-day Bluegill or Crappie. This beautiful specimen is fully complete and has incredible detail preserved - the backbone, fins, tail, and other bones are all distinct and very easily seen. Even the scale pattern can be seen near the tail (RARE!). And, best of all, the fish is wonderfully centered on the rectangular plate of shale - and it has been professionally framed for optimal display! This is one of the best examples of this type ever found, and it just happens to have been framed to be enjoyed forever!